Apple on Friday released a new video spot promoting the iPhone XR, once again concentrating on the chassis colors buyers can choose from. 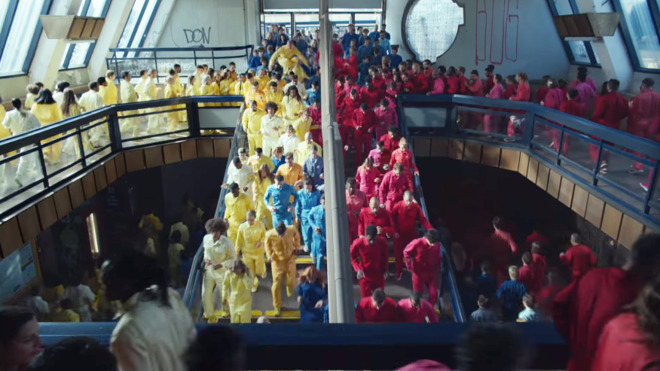 The commercial features hundreds of people in different-colored jumpsuits, running and flipping over urban terrain until they all converge on a central location. Most of the suits reflect colors the iPhone XR is sold in, such as red and coral, though there are also green and purple runners as well. That may be because the ad ends with text highlighting the XR's "Liquid Retina" display. It's an edge-to-edge LCD measuring 6.1 inches, with a pixel resolution of 1,792 by 828. That contrasts with the iPhone XS -- which has a 5.8-inch OLED panel with 2,436-by-1,125 resolution -- and the XS Max, which bumps screen size to 6.5 inches and resolution to 2,688 by 1,242. The XR starts at $749 versus the XS's $999 though, and it's expected that the XR will ultimately emerge as Apple's bestselling 2018 iPhone model. That may not be good news, as sales of the device are forecast to be lower than anticipated. They did the same thing with the 5S. Phil needs to stay relevant. I find it odd that we try and always anticipate how things at Apple are going in advance of reality. Always assuming the worst, such as XR is the best selling iPhone, but may not sell as many as expected because some dimwit analyst thats wrong more than right, says so. And now that Apple has wisely decided to stop the number games, which no one else ever played, these analysts are going be guessing even more than before.. lets see what the final numbers really are before deciding whether Apple has problems. If Apple has decided to quit the numbers game, how are you going to know what the final numbers are? Terrible ad. They look like the lemmings of the Mac ad or even the gray people on the seats of the 1984 ad. Boring song, poor execution, the "colors" are washed down too much, people run with no apparent goal or look like inmates escaping from a prison (which makes them scary). Gee, Apple, you can do much better. The numbers game to which I refer is publishing unit sales of devices, which they never did with the Apple Watch and now are not doing it with any iPhones or other products now if I recall correctly..
Not an inspiring ad. Fun, but nothing else. Dumb commercial. Color isn’t in the top 10 reasons to buy an a new iPhone. That said, Apple should be touting improved durability. I’d be interested to see Apple’s durability testing facility (and tests). Don’t forget that Apple now has a clear case to show off the color. Because it’s only possible to have one or the other? So all those times Apple would put out press releases touting the record number of iPhones they sold on launch weekend was a race-to-the-bottom? This argument that increased unit sales equals a race-to-the-bottom is so stupid. If Apple’s unit sales were increasing right now nobody here would be talking about a race-to-the-bottom. It was so... um, gay! Rather creepy ad. Reminds me of Logan's Run. Considering they’ve been the single best-selling handset since at least then, it seems to be working for them and their historic record-setting profit. Got any other tips for management? I believe he means... Revenue and earnings dustribution numbers across different products lines. Not actual unit numbers.